When it comes to assigning our kids family chores to do around the house, virtually all parents think it's a great idea. But many of us also find it can be a big hassle when we try to get the kids to actually do the assigned work. Yes, it may sometimes seem easier to just take out that bag of trash yourself than to get into a big argument with the kids over whose turn it is, or why that simple job can't be done now. But what the experts advise is not to let such household responsibilities slide. 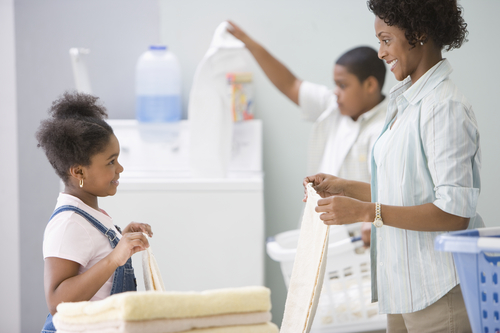 Having your kids do assigned chores can be an important factor in helping them develop in positive ways. Chores are a way for a child to feel part of the family, and to gain a sense of contributing toward the family good. These early life lessons make it easier for a person to feel like an active, contributing member of society later in life. Getting chores completed successfully, however, does require planning and work on the part of parents. You want to make assignments that are appropriate for a child’s age and abilities so successful completion and positive experiences are most likely. You also have to keep your expectations reasonable. If you are a perfectionist and criticize how every chore is done, you're setting your child up for failure, unable to meet your expectations. Instead, set realistic, attainable goals. And don't let your child get away with little or no effort since that is teaching him or her to have their own low expectations and to question their abilities to do good work. Talk to your child about setting up a chore system. Clearly explain responsibilities and what constitutes successful completion of a task. Develop rewards for work well done, and take the time to monitor chore activities and to offer honest praise for carrying out assigned tasks successfully.